On Guardians of the Galaxy, Marvel turned an obscure comic into the year’s biggest superhero movie. Senior illustrator Rodney Fuentebella reveals the role of the studio’s visual development team in bringing it to life. Lead visual development artist Rodney Fuentebella has degrees in design from UCLA and Art Center College of Design. Born in the Philippines and raised in San Francisco, he has worked on projects for Electronic Arts, Atari, DreamWorks Animation, Rhythm & Hues and Wired magazine, and now works in the visual development team at Marvel Studios. At Marvel, Rodney has created key art and character designs for projects including the Captain America movies, The Avengers, Iron Man 3 and Guardians of the Galaxy. Adapted from one of Marvel’s lesser-known comics – on its publication in May 2008, the first volume only reached number 61 in the monthly sales charts – Guardians was a surprise box-office smash, becoming the second-highest-grossing film in North America in 2014. A large part of that success was down to Marvel’s viz dev department, which helped establish the look of the movie’s alien environments, and the varied characters that make up the Guardians of the Galaxy themselves. This Thursday, 5 February, Rodney will be one of five Marvel concept artists discussing their work on the movie at a free event hosted by Hollywood’s Gnomon School of Visual Effects. We caught up with him to discuss the creative process behind that work, and his advice for young artists hoping to follow in his footsteps. CG Channel: How did working on Guardians of the Galaxy compare to previous Marvel movies? Rodney Fuentebella: It was totally different. I was also working on Captain America: The Winter Soldier at the time, and since the first Captain America was already made, we had an idea of how that would look. Going into this project, we had no idea. After all, this is a movie that stars a walking tree and a talking raccoon. CGC: What kind of reference material did you get? RF: We work in conjunction with the storyboards, so we do have an idea of the script. But we’re on the front end [of the project], before it gets finalised, so we come up with the initial designs, the overall look and feel. In my own images, other concept artists had already worked on Xandar, so we had an idea of how that would look already. For my image of the big ship crashing down, I had a couple of [concepts] other artists had done of the planet, so from there we could work in conjunction. 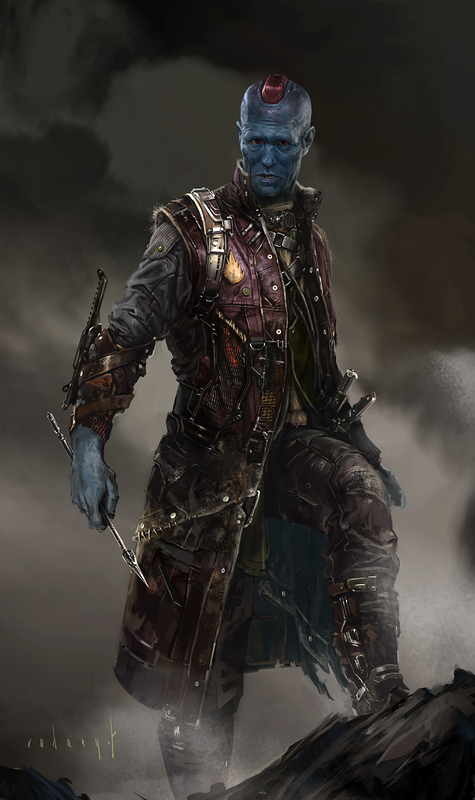 Yondu Udonta: space pirate and surrogate father figure to Guardians of the Galaxy lead character Peter Quill. Rodney describes his costume as a patchwork of trophies retrieved from his previous conquests. CGC: As well as illustrating those key scenes, you designed Yondu. Talk us through that process. RF: We always look for what we can take from the comics, and in this case, the original version of Yondu had a very long fin [on his head]. For the movie, we couldn’t have anything like that, but James [director James Gunn] had the idea of making the fin have some functionality: maybe something to do with how he fights. In the comics, he had a bow and arrow, like an archer, but because it was sci-fi, we thought maybe the arrow would fly on its own. We wanted the fin to control what the arrow would do. We played around with him having real hair, [before eventually] coming up with him having a metallic piece on top of his head that would control [the arrow]. 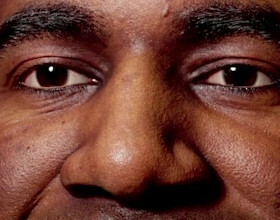 It’s something implanted in him connected to his brain. He’s a pirate, basically, so we also played around with ideas of having him taken things from his previous conquests … that these things he had taken from the people he conquered would be sewn on him or attached to them to give him a patchwork look. CGC: How many iterations of the design did you do? RF: In the initial passes, we did a couple of different variations of what he would look like – a couple of him without a shirt on, and some with different versions of the patchwork. When we first got the assignment, we didn’t know who the actor [playing Yondu] would be, so once we knew it was going to be Michael Rooker, we played around with that, too. Then we [had to decide] if he was going to look more alien or less alien – whether he had any tattoos or some type of alien skin prosthetic. I worked on him for a month or so in total. At first Yondu wasn’t going to have such a big role in the movie, so I was excited that he was on screen for as long as he was. I think what came out in the film looks great. A key art illustration for Guardians of the Galaxy, intended to help director James Gunn resolve important shots. The look of the planet was established by Rodney and other artists in Marvel’s visual development team. CGC: What advice would you give to artists hoping to work in visual development at a studio like Marvel? RF: Be humble. This industry is quite small, and we work in close collaboration with one another. We have such a tight-knit group in viz dev that we want people we get along well with. CGC: Is Marvel a studio you could work at straight after school? RF: Speaking for myself, I wouldn’t have been ready. It’s a very demanding job, and I needed to have experience of what it would be like to work professionally with other people, with tight deadlines. School is your own personal work. But what we’re doing is providing visual solutions for problems. I needed experience in [other jobs] to know what that was like. CGC: So what should young concept artists try to learn in their first years in the industry? RF: The most important thing is to try a lot of different things and know how to do a lot of different things [besides digital painting]: how to do 3D, how a pipeline works, and so on. From there, try to figure out your speciality. We get tasked with a lot of different stuff, but [it’s helpful to know] that you specialise in figures, or in complex environments with a lot of people interacting, or mechanical objects. But even then, you have to [be able] to do other genres. You never know what your next job is going to be. CGC: Good advice. Anything else? RF: Know what you’re not good at – and try to figure out why. For example, I have a love-hate relationship with 3D. I knew I wasn’t good at it, but I tried my hardest to figure out what it is. When I first got hired at Marvel, I knew I that had to learn 3D one of these days, so at weekends, I’d go home and do tutorials. The first couple of things I did were terrible, but I just said: ‘Okay, it’s fine. I’ll just keep at it and see what happens.’ You just have to swallow your pride. And eventually, I did figure out a couple of things that help me do the work I do professionally. Now I can do a quick mock-up in 3D, throw in a couple of lights, and know whether a shot will work. [On Guardians], for the two shots in the prison and the mining planet, I worked them out [in 2D] first, but I also did a rough layout in Modo. While helping to develop Guardians of the Galaxy’s prison environments, Rodney supplemented his 2D images with a rough 3D mock-up, created in Modo, designed to test how the concepts would look on camera. CGC: Did you have any idea how big Guardians of the Galaxy would be? RF: No. We knew it was going to be a good movie, but we didn’t know it would be such a huge sensation. When we were working on it, we’d always have to explain to people what the movie was about. We’d go: ‘So there’s a walking tree and a talking raccoon…’ and they’d go, ‘Oh. I was expecting something like Iron Man.’ But once we saw the first trailer, it was clear it was something special. CGC: But only when you saw the trailer? RF: There were so many moving parts. All these characters, all these environments. Even when you put all of the characters side by side, they’re all completely different. I think the story is what keeps everything coherent. It’s almost like a symphony, with all of these different instruments: story, world and character. CGC: There will be a lot of Guardians fans in the audience on Thursday. What will be the highlight for them? RF: A lot of the work my co-workers have done is amazing. One of the great things about these presentations is being able to step back and look at the images other people have created, and think: ‘Wow. That’s cool.’ [Laughs] I’m a fan, too.